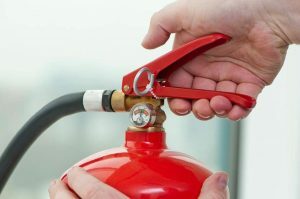 Understanding proper fire extinguisher maintenance procedures is essential for everyone’s safety. Maintaining proper fire safety standards is critical. Unfortunately, many homes and businesses don’t properly maintain their fire extinguishers and don’t realize it until it is too late. Proper fire extinguisher maintenance can mean the difference between disaster and a minor accident. Here are some of the most common fire extinguisher violations and how you can prevent them from occurring. Obviously, a missing fire extinguisher is a huge problem. You should have the proper number of fire extinguishers for your facility installed throughout. Beyond having the right number of fire extinguishers, you should also have each fire extinguisher clearly marked or labeled. These labels can be as simple as a bright red sign with FIRE-printed on it or large arrows to designate the spot. If there are any marked locations in your business that don’t have a fire extinguisher beneath the sign, you would be in a violation of the fire code. Ensure that you have the right number of fire extinguishers and that all of them are clearly marked to properly follow the fire code. If you use a fire extinguisher completely, never replace it right to the location where it previously was located. An empty fire extinguisher is just as bad (or in some cases even worse) than a missing fire extinguisher. If you have an empty fire extinguisher, valuable moments that could have been used to extinguish the fire differently or evacuate the building will be wasted trying to get the fire extinguisher to work. If you have an empty fire extinguisher, make sure that you replace it with a properly working one right away. If you aren’t sure, ask the professionals during your fire safety inspection with Anderson Fire Protection. This is the most common fire code violation that many business owners receive. A blocked fire extinguisher is often useless in the case of an emergency since employees cannot locate it or spend valuable minutes trying to move the things blocking it to access it. Always keep your fire extinguishers clearly labeled and easy to access. This entry was posted on Wednesday, July 12th, 2017 at 1:34 pm. Both comments and pings are currently closed.